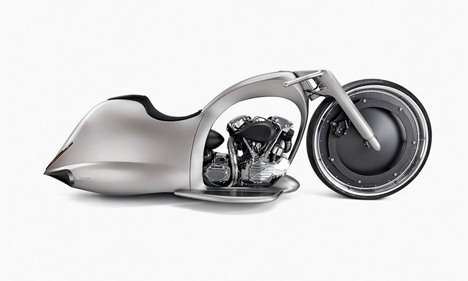 This ultra-slick motorcycle wouldn’t just catch the eyes of bystanders as you roll down the street. It’s almost guaranteed to literally stop traffic. 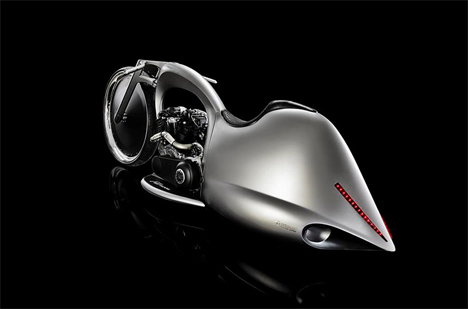 The Full Moon Motorcycle from Akrapovic and Dreamachine Motorcycles is so unique as to be almost unrecognizable as a motorcycle. The idea behind the design was to create something that defies definition. The Full Moon does that and then some with a seriously flashy body and some surprisingly sensible features. 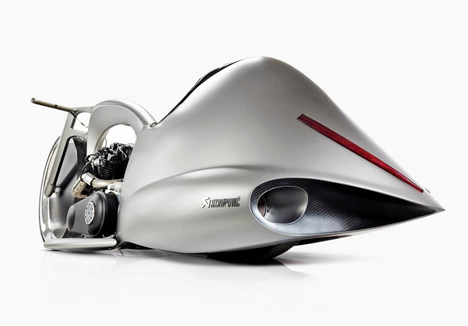 Aside from its fanciful body that looks a bit like a long, silver wasp, the Full Moon features twin custom-made exhausts and a hydraulic suspension that keeps the bike standing upright even when parked. The steering system is automated to get rid of visual clutter in the form of messy cables. The front end sports a whopping 30 inch aluminum and carbon wheel to complement the already-futuristic looking ride. The bike has some impressive power, as well – sitting in the middle of that sleek body is an S&S Knucklehead 1,524 cc engine. 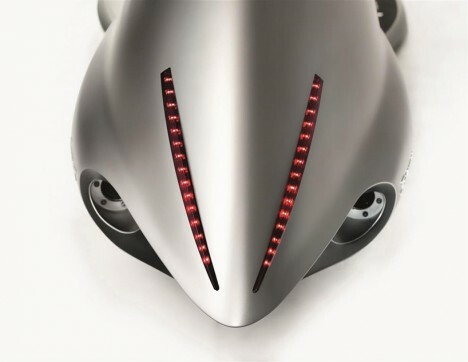 The impressive bike is just a display concept for now, but it gained massive attention when it debuted at the Bad Salzuflen Custombike Show in Germany. See more in Art Vehicles or under Transportation. December, 2014.